In this dual blog posting, the Forum’s Karen Pittman and Stephanie Malia Krauss weigh in on an article about competence-based vs. traditional education. Pittman and Krauss reflect on their own experiences and offer suggestions on how schools can break free from the status quo. Think Homework Can Help Your Kid’s Grade? Think Again. When I saw the above headline on a St. Louis Post-Dispatch article, I expected to read about the contribution of homework to building knowledge and succeeding in courses, vs. the need for kids to have balanced lives. (In the D.C. area, where I live, there are occasional backlashes to excess homework requirements.) So I was intrigued to learn that the article was about parent reactions to a school district’s decision to change the formula behind course grades: shifting the emphasis from compliance (completed homework, good behavior and class participation) to competence (exam results and the quality of work). The reason for the shift underscores the slow-burning tension that, I hope, will ultimately fuel a fundamental overhaul of this country’s approach to teaching and learning. In Missouri, honor roll students with straight-A report cards failed the state tests that are aligned with the Common Core standards, which spell out what students should be able to know and do in each grade. Nostalgia. Schools should work the way they did when I grew up. Pragmatism. High school is free, college is not. We don’t do kids favors by inflating their grades in high school; they should be prepared for the rigors of college. Results. Learning and mastery are the end goals, and that’s where the emphasis should be. External Motivation. Students won’t do the homework if it doesn’t count toward the grade. Internal Motivation. Students will do the homework once they begin to understand that practice and assessment are the paths to mastery. Life Skills. Punctuality and task completion are skills employers want. Doing homework builds those skills. The comments from teachers, administrators and researchers hint at the way around this unproductive and unfortunate standoff. Every parent wants their child to be ready for what comes next: college, work, the military, life. Every parent understands that school is the primary institution we rely on to provide opportunities to learn, practice and master not only content and skills, but attitudes and behaviors that combine to yield competent, caring young people. And every parent understands that the information they need to monitor their schools and guide their children cannot be summed up in a letter (such as C+) and can often be masked by too many numbers. Mastery is the goal. Students, parents, teachers and communities would be better served if the list of competencies to be mastered went beyond the 3 Rs. In a survey of more than 400 employers about the “readiness” of high school graduates applying for entry- level jobs, the employer said four in 10 of their diploma-toting applicants are “not ready for work” – not because of reading and math deficiencies, but because they lacked basic skills such as problem-solving, work ethic, communications and team work. 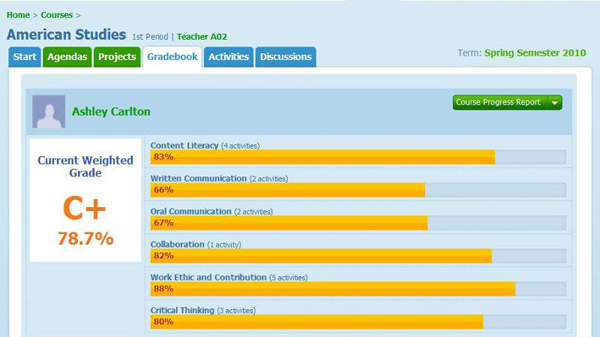 Why not create report cards, like those used by New Tech Network, that score students on content mastery and 21st century skills? Report cards that are aligned with course goals, lesson plans and in- class and out-of-class activities will ensure that students had opportunities to learn and practice the content and the skills. Ashley nailed the content and demonstrated strong writing skills, but scored low on the four other dimensions. Omar (whose native language is not English) struggled with the content, writing and oral presentations, but worked hard, collaborated well and demonstrated good critical thinking skills. The C+ conveyed to both the need to work harder. The detail tells them (and their parents and mentors) what they should work harder on. Both will be more prepared for life if they are supported and expected to grow in all areas in the classroom and at home. Think again: Homework can help our kids’ grades and secure their futures, if it is designed to affirm and strengthen all of these skills. The St. Louis Post-Dispatch article “Think Homework Can Help Your Kid’s Grade? Think Again” touched on a growing national debate in public education: Should youth move ahead in school based on what they know and can do (competency-based education), or based on some combination of time spent in class, age, and achievement (traditional education)? The adoption of standards-based grading by school districts around the country (including some of Missouri’s highest-performing ones) means that many see the value of competency-based education and performance-based grading. These offer a clear picture of student mastery and need, plus specific input into what that means for graduation or transition into the next grade. This can motivate and engage youth, plus provide clarity and direction for the adults who support them. But adopting these approaches requires changes well beyond the classroom. The basic problem is that too many youth have transcripts or diplomas that don’t reflect gaps in learning. I saw this when I ran Shearwater High School, a St. Louis-based charter school for disconnected and dropout youth. Prospective students had high school transcripts, but only one in 10 performed at the high school level in both reading and math. While everyone wants to close those gaps, we can’t do that without a significant shift in state and district policies. Prevailing policies that deal with graduation, credit accrual and grading are rooted in the traditional, time-based system. Here’s where that’s a problem: At Shearwater, we attempted to fully institute competency- and performance-based approaches. We constantly struggled to resolve the incompatibility between how we operated and what Missouri required of its public high schools. Eventually, our board decided to close the school. Advocate for an alternative to “seat-time” requirements. Missouri requires 7,830 minutes of in-class time for every one unit of credit earned – a typical approach. Some states, like New Hampshire, have totally removed this requirement (known as the Carnegie Unit) in exchange for a credit-for-competency approach. Get specific, written permission from your state department of education to institute competency-based approaches. Missouri requires districts to obtain written permission whenever they offer competency-based credit options or performance-based graduation requirements. Expand opportunities for learning and earning credit beyond the classroom. This is a natural way to engage parents and the broader community in student learning. When credit is based on competence and not seat-time, then learning and demonstration of mastery should be happening in and out of school. Modify related district policies. Ensure that all local policies affecting graduation, credit accrual, grading and “seat-time” reflect the flexibility and terms of competency- and performance-based practices. Invest your community and the young people that you serve. These approaches require a cultural shift and emotional investment by staff, students and families. Engage them in dialogue about the change.